The collapse of the Cuban economy in the early 1990s ended abruptly in 1994, gave way to a relatively strong recovery for a couple of years, and then to a period of positive, albeit modest, growth in 1997-98. At least that is the story the official numbers tell. As shown in Figure 1, real GDP contracted at an average annual rate of 10 percent from 1990 to 1993, before rising at an average of almost 4 percent a year in the period 1994-1996.2 Real GDP growth averaged less than 2 percent in 1997-98. Can these movements be explained? It is easy to account for the economic contraction in 1990-93 on the basis of the collapse of domestic investment resulting from the cessation of Soviet assistance to Cuba, and the disruptions caused by the sharp fall in trade with Cuba’s traditional trading partners in the defunct CMEA. 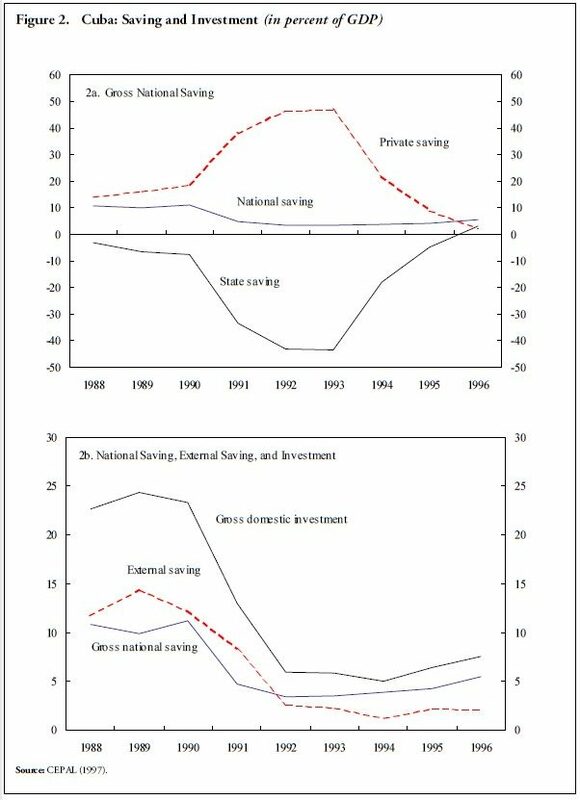 At first sight, however, the sudden shift to positive growth in 1994-96 is more difficult to understand in view of the rough stability in the ratio of domestic investment to GDP during that period (see Figure 1). The shift may also seem quite sudden in light of the experience of those transition economies of Eastern Europe and the former Soviet Union, and particularly of those where the implementation of structural reforms was incomplete, as has been the case in Cuba. 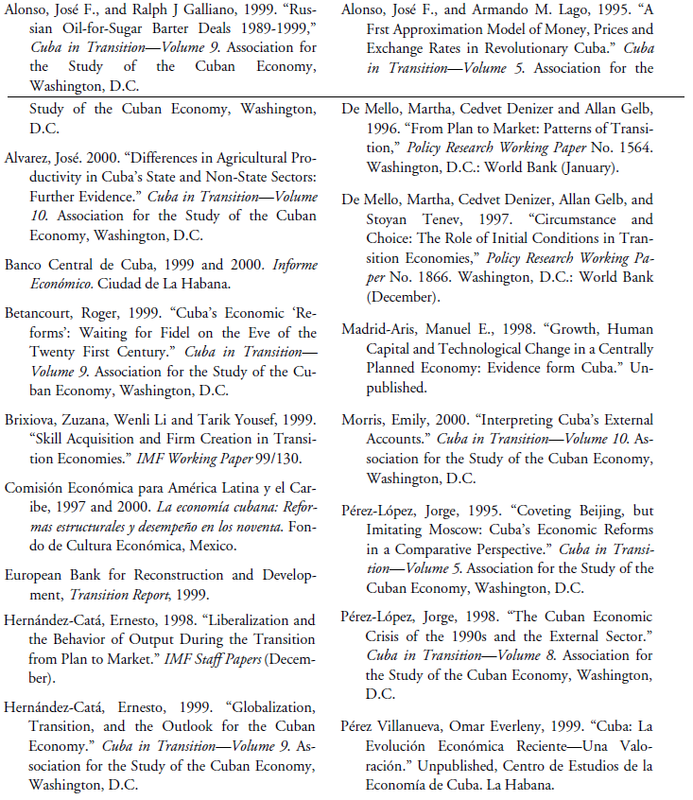 Against this background, this paper reviews macroeconomic developments in Cuba during the 1990s and seeks to explain the jagged pattern of growth in that period. The conventional growth accounting exercise presented below suggests that the fall and recovery of output growth in the 1990s cannot be fully attributed to the behavior of capital and labor inputs, and must be explained largely by movements in total factor productivity (TFP). The paper then examines the 1994-96 recovery on the basis of three alternative explanations: (i) that the numbers are not credible; (ii) that the 1994-96 recovery actually took place and reflected a surge in productivity resulting from the policies of macroeconomic stabilization and liberalization implemented in late 1993 and 1994; and (iii) that the recovery resulted from a favorable demand shock. The second explanation, which is consistent with both the improved performance in 1994-96 and with the fairly weak growth in 1997-98, appears to be the most convincing. The analysis also suggests that a strong and durable expansion is unlikely to be achieved in the period ahead on the basis of present policies, but that the benefits of a full liberalization of the economy are likely to be considerable. For three decades, the Cuban economy had benefited from massive economic assistance by the Soviet Union. The assistance mainly took the form of heavily subsidized exchanges of Cuban sugar exports for Soviet oil imports. In addition, Cuba obtained significant amounts of subsidized Soviet oil over and above its domestic consumption needs, that the Cuban government was able to sell at world market prices and use the proceeds to finance hard currency imports. These non-repayable subsidies amounted to an annual average of US$2 billion in 1986-90. In the same period, the Soviet Union extended loans to Cuba averaging US$2.3 billion a year (Pérez-López, 1998). Thus total Soviet assistance averaged US$4.3 billion in 1986-90, or 15 percent of Cuba’s GDP if converted at the official rate of 1 peso per US$, and probably much more if converted at a market exchange rate. Soviet assistance began to decline in 1989. Crumbling under the weight of budgetary problems (including the mounting external debt) and a fall in oil output, the Soviet Union under Gorbachev ended the subsidized exchange of Cuban sugar for Soviet oil and demanded payment in cash (see Alonso and Galliano, 1999). This forced Cuba to slash oil imports and buy whatever it could afford to buy in world markets, at much higher prices. What remained of Soviet assistance was slashed by the Russian Federation in 1992, and trade with the former Soviet bloc virtually disappeared. Figure 2b illustrates the dramatic effects of these events on Cuba’s flow-of-funds accounts. The ratio of foreign saving to GDP peaked at more than 14 percent in 1989, fell to 12 percent in 1990 and then plunged to 1 percent in 1994. Gross national saving also fell in relation to GDP, from 11 percent in 1990 to less than 4 percent in 1994. As a result, the ratio of gross domestic investment to GDP collapsed from just over 23 percent of GDP in 1990 to 5 percent in 1994, as the country began to consume its stock of fixed capital and to run down inventories a rapid pace. With many prices still rigidly controlled well below market clearing levels, the government in effect forced the population to hold monetary balances well in excess of desired levels. This growing monetary overhang was reflected in the (involuntary) surge in household saving (see Figure 2a), and increasingly acute shortages of many goods in spite of the steep rundown in inventories. Not all prices were controlled, however. In particular black markets for agricultural products, which had existed at various levels throughout most of the communist period, were now expanding. Therefore, monetary financing of the deficit was also reflected in a rise in inflation. The rate of increase in the GDP deflator rose from 3.4 percent in 1990 to 17.4 percent in 1993 (in spite of widespread price controls), and inflation in informal and black markets surged from 2 percent in 1990 to more than 200 percent in 1993. In the labor market, the heavy subsidization of the state sector limited the drop in state employment to 3½ percent of the labor force, which was partly offset by some employment growth in the private sector. The overall unemployment rate actually fell, as the decline in overall employment was more than offset by a 3 percent decline in the labor force that reflected a large outflow of discouraged workers (See Table 3). But the containment of unemployment came at a high price in terms of falling living standards for the population, including a severe intensification of rationing and frequent interruptions of electricity and water supply. The process of adjustment by brute force could not continue. The monetary overhang, shortages, and rationing queues were growing; inflation was threatening to get out of control; and economic activity was collapsing. Someone apparently succeeded in convincing president Castro that another method of adjustment had to be tried before the patience of the population was exhausted. While the long-term strategy of the government remained the final triumph of socialism (see Hernández-Catá, 1999), a revised economic strategy was implemented beginning in late1993 as a tactical way out of the previous, failed adjustment policy. The new approach had two components: macroeconomic adjustment and liberalization measures.4 In the macro-policy area, decisive measures were taken to improve the fiscal position. Several tax measures could not arrest the decline in revenue. However state expenditure fell massively both in nominal terms and in relation to GDP. The fall affected all key sectors, including the social area. Most importantly, subsidies to enterprises, which had increased sharply during the crisis period, experienced a dramatic fall in 1994 and subsequent years. The result was an astounding drop in the fiscal deficit, from 30 percent of GDP in 1993 to 7 percent in 1994 and to 2 ½ percent in 1996. This made it possible to reduce the level of the money supply, which—together with the decontrol of prices outside the state sector— helped to reduce the monetary overhang. Monetary deflation also led to a large reduction of price levels in uncontrolled markets, and to an appreciable decline of inflation as measured by the GDP deflator (see Tables 1 and 2). The level of the new consumer price index fell by 11 percent in 1995 while the GDP deflator rose by 12 percent, with the difference probably reflecting the large appreciation of the peso in that year (bottom of Table 2). These adjustment measures had a massive impact on the flows-of-funds. As shown in Figure 2a, the huge and broadly offsetting increases in government dissaving and in forced household saving that had occurred during the crisis period were more than reversed, reflecting the fiscal adjustment and the decline in the monetary overhang. Total national saving actually rose from 1993 to 1996, particularly in the latter year when transfers from abroad5 exceeded net interest payments abroad, while foreign saving stopped falling and stabilized at around 2 percent of GDP. As a result, the contraction in the ratio of domestic investment to GDP came to an end in 1994 and the ratio rose modestly in 1995-96. 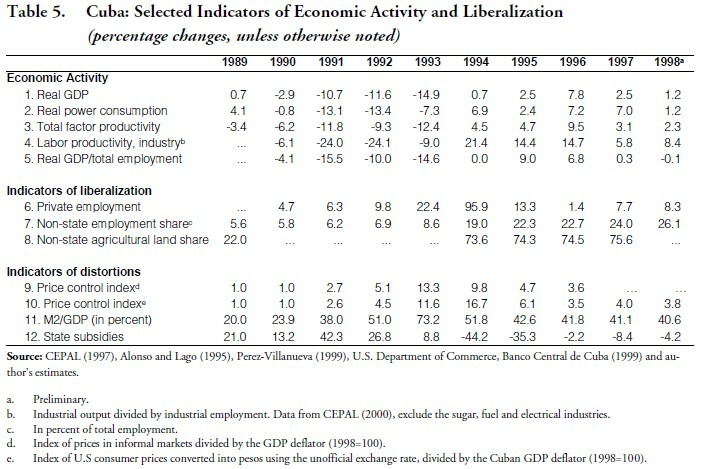 Macro-economic stabilization in the period 1994-95 was accompanied by several measures aimed at liberalizing partly certain sectors of the economy (see Box).6 Owing largely to these measures, employment increased sharply in the private sector, almost offsetting massive layoffs in the state sector; the unemployment rate increased only by only 1.3 percent of the labor force during 1994-96, and outflows of discouraged workers from the labor force diminished considerably in comparison with 1990-93. Was all this sufficient to account for the turnaround in growth? Table 4 begins to examine this question on the basis of a simple growth accounting framework. 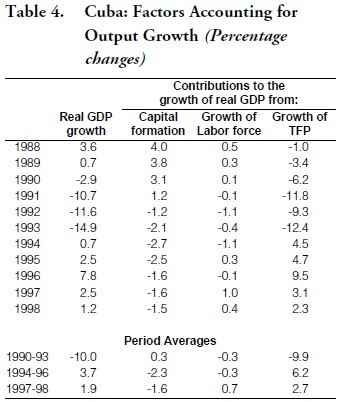 The growth of real GDP during the period 1988-98 is broken down into three components: fixed capital formation, labor force growth, and total factor productivity (TFP) growth.7 It is clear from the table that both the fall in output in 1990-93 and its recovery beginning in 1994 reflected mostly changes in TFP. The contribution of fixed capital formation and the labor force is negligible for the period 1990-93 as a whole, although the contribution of fixed investment declines sharply within the period and becomes negative in 1992-93. In 1994-96, the net contribution of capital formation and labor force growth is negative, implying that the recovery of output during that period was more than accounted for by rapid growth in TFP. In Table 4, TFP growth is calculated residually — i.e., by subtracting the contributions of fixed capital formation and labor force growth from the rate of change in real GDP. Therefore TFP growth reflects changes in all the technological, economic and institutional factors that are not included in the measurement of capital and labor; it also reflects changes in capacity utilization, i.e., in the difference between potential and actual output. On that basis, the drop in TFP in the period 1990-93 is not surprising given the disruptions (financial, commercial and technical) associated with the end of Soviet assistance to Cuba, including the dramatic increase in the cost of imported oil. A flattening out of the level of TFP could have been expected in the subsequent period, given the once-and-for all nature of these shocks. But these shocks were also permanent, and therefore the huge turnaround from negative to positive growth of TFP in 1994 is much harder to explain. 1994-96: RECOVERY INDUCED BY LIBERALIZATION OR MIRAGE? Is such a strong and sudden increase in productivity possible? If not, it casts doubt on the credibility of the official statistics, and this likely would show up in inconsistencies in the data. If the answer is positive, there should be some explanation for the upswing in output in 1994 and the return to positive growth in 1995-96. One explanation suggested by Betancourt (1999) is that the turnaround in economic performance reflected the beneficial supply side effects of liberalization on the growth of productivity and potential output. Another, less persuasive, explanation is that the upswing in 1994 reflected a rise in capacity utilization triggered by some exogenous increase in aggregate demand. This section examines these three possibilities in turn. It does not claim to reach strong conclusions. The publicly available base of Cuban data is limited, although for the period after 1989-98 the study of the UN Comisión Económica para América Latina y el Caribe (CEPAL 1997, updated in 2000) provides a large number of statistical series, many of them previously unpublished. Moreover, the Central Bank of Cuba in its annual reports now provides updates for key macroeconomic time series, including on the balance of payments (but not, for example, for labor market variables). The period for which a sufficient set of key data are available is too short to allow for a thorough statistical analysis of time series. Nevertheless, the available data suggests some possible answers. Another noteworthy result in Table 5 is that total factor productivity, as derived from the growth accounting framework, is correlated with data on labor productivity growth in the industrial sector derived from official industry-by-industry data (lines 3 and 4). In particular, both productivity series show negative growth in 1990-93 and an upswing in 1994. The sharp recovery of industrial labor productivity in 1994, which reflects to a large extent labor shedding, was very broadly based across industrial sectors. The evolution of another measure of labor productivity, the ratio of real GDP to total employment, is also broadly similar to that of TFP. In sum, if there was a conspiracy to rig the numbers, someone appears to have gone to extraordinary lengths in order to establish consistency among the falsified numbers. Liberalization as a Source of Productivity Growth? The other variables in Table 5 illustrate the effects of labor market and price liberalization. As indicated in line 6, private employment grows throughout the period 1990-96 and surges in 1994, right after the measures liberalizing self-employment and private farming. The share of private to total employment also increases very rapidly beginning in 1994 (line 7). And the non-sate sector share of agricultural land also rises considerably from 1989 to 1994, with most of the change probably occurring in 1993-94 (line 8). Assuming that productivity is generally higher in the private sector that in the public sector, the increase in the private employment share should involve a rise in the average productivity of labor. In the context of the simple growth accounting framework of Table 4 (where labor is assumed to be homogenous and its productivity to be constant) this rise would show up as an increase in TFP growth. The assumption about higher productivity in the non-state sector is confirmed by Alvarez (2000) in the cases of sugar, tobacco, and a few other farm products (where the yield differential in favor of the non-state sector averages 11.4 percent in the period 1969-97). More generally, Alvarez finds that yields tend to rise as the share of the non-state sector increases, in spite of that sector’s reduced access to factors of production. Two proxies for the intensity of price controls (lines 9 and 10) show a widening gap between equilibrium prices and actual prices from 1990 to 1993, as inflation rises in black markets while price controls remain widespread, confirming anecdotal evidence of severe shortages and queues in controlled markets during that period.9 From 1993 on, however, there is a large decline in both price controls proxies, as inflationary pressures subside and prices are liberalized in some sectors—in about one fourth to one third of the economy, judging by the private sector’s 1998 shares of both employment and household purchases, but probably more given the existence of a significant underground sector. Line 11 shows the ratio of the money supply to GDP—a proximate measure of the monetary overhang. Not surprisingly, this ratio appears to be correlated with the two indicators of price control, suggesting that the monetary overhang increased rapidly through 1993 and fell significantly thereafter, reflecting the combination of a disinflationary fiscal/monetary policy and price deregulation. It also suggests that a substantial overhang remained in 1996. Finally, line 12 shows budgetary subsidies surging in 1992-93, slowing abruptly in 1994, and then falling sharply in the next few years. Is There a Keynesian Explanation? It may be argued that the recovery of output in 1994-96 did not result from the favorable impact of liberalization on aggregate supply but rather from a Keynesian-type aggregate demand shock. It is clear that capacity output in Cuba fell in the early 1990s because of the disruptions associated with the collapse of the Soviet Union. Moreover, it is likely that the decline in actual output in that period was magnified by the adverse effects on aggregate demand of the fall household consumption and investment. Along the same lines, it could be argued that the 1994-96 recovery may have reflected, at least in part, a positive keynesian shock that boosted aggregate demand and capacity utilization, raising actual output even in the absence of an expansion in potential output. For this to be true, however, we should be able to identify a positive demand shock, i.e., a large exogenous increase in some component of aggregate demand occurring in 1994 or slightly earlier. There was certainly no fiscal shock. 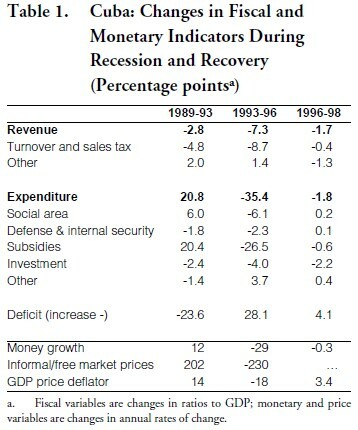 After surging during the crisis period, the fiscal deficit contracted in relation to GDP by 23 percentage points during the recovery from 1993 to 1996 (see Table 1). Neither was there any relaxation of monetary policy— actually, money growth in the 1990s was inversely correlated with GDP growth. There was no export boom: in real terms, exports of goods and services continued to fall in 1994 and 1995, although they increased strongly in 1996. And there was certainly no sugar boom: output of sugar cane stagnated in 1994, fell in 1995 to a low of 33.6 million tons, and recovered temporarily in 1996 to 41.3 million tons—still well below the levels registered in the early 1900s. Finally, there was not much of an investment boom: real gross domestic capital formation increased from 1993 to 1996, but not by much; in the latter year it was still about one fifth of its level in 1990 (net investment probably fell throughout most of the 1990s). Finally, there is no doubt that national income has been boosted in the period after the legalization on the use of foreign currency in 1993 by dollar remittances transfers from abroad—largely from Cuban relatives living in the United States—although there is uncertainty as to the precise magnitude of these remittances. (In this area, as in the area of the national accounts, CEPAL data differ from that published by Cuban official sources, notably Banco Central de Cuba, 1999, for reasons that remain unclear.) However, according to central bank data, these remittances have been offset in large measure by interest payments on Cuba’s foreign debt. 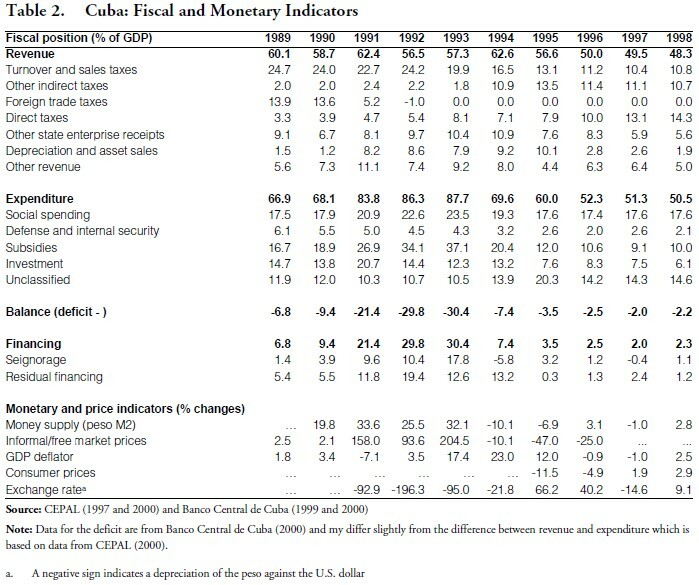 Still, the balance on net transfers and factor payments—the difference between national disposable income and GDP—appears to be an increasingly favorable element in Cuba’s balance of payments, rising from zero in 1993 to the equivalent of 1 percent of GDP in 1996 and 1.5 percent in 1998. Another way to evaluate the behavior of output in Cuba during the period 1990-96 is to compare economic developments in Cuba and in the countries in transition from central planning to a market economy during that period. 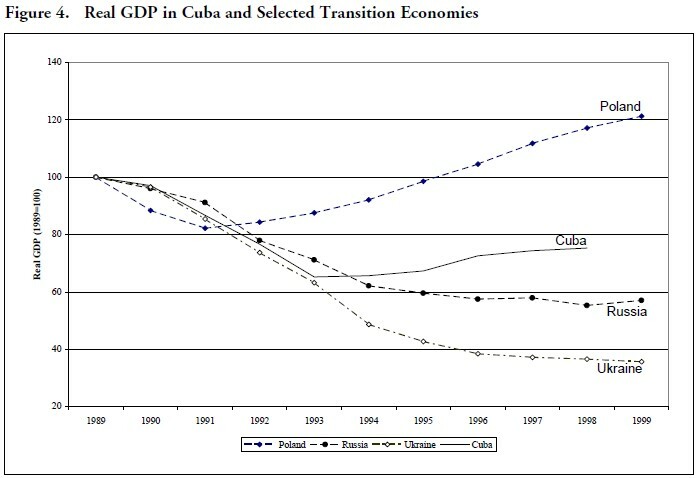 Figure 4 shows the behavior of output indices in Cuba and in three transition economies: Poland, Russia and Ukraine. The pattern of production in Poland is characteristic of the early and fast reformers, like the Czech Republic, Hungary and the Baltic countries: production initially falls steeply, but after a few years it flattens out and begins to increase rapidly.10 In contrast, Ukraine represents the case of a slow reformer (like Turkmenistan and Belarus) where output initially falls less sharply than among the aggressive reformers, but then fails to recover for many years. Russia can be viewed as an “intermediate” reformer, but one with below-average performance of output, partly because of exceptionally difficult starting conditions including a particularly long period of central planning, and a large, inefficient industrial sector. It is also likely that the underground economy in Russia is underestimated in the official statistics to a greater extent than in many central and eastern European countries, including Poland. Compared to those three countries, the evolution of real GDP in Cuba is remarkable: in the first years, i.e., through 1993, it is virtually indistinguishable from that of the slow reformer, Ukraine. Beginning in 1994, however, the Cuban output index turns up while that of Ukraine continues to decline. By 1998, Cuba’s output index is still substantially below that of the rapid reformer, Poland, and well bellow its own level in 1989; but it is above the level of both the Ukrainian and Russian indexes. This is a surprising pattern, but it could be rationalized along the following lines. From 1989 to 1993 both Cuba and the Ukraine made very little if any progress in reforming their economies and allowed inflation to increase to high levels (actually, to much higher levels in Ukraine than in Cuba). This similarity, coupled with the impact on both economies of the collapse of CMEA trade arrangements and the elimination of subsidies and state orders by Russia, would account for a similar evolution of economic activity in that period. Beginning in 1994, however, Cuba introduces measures to liberalize part of the economy and implements a rigorous macro-stabilization program which quickly reduces inflation to low levels. In contrast, Ukraine’s liberalization program proceeds slowly, and while inflation begins to decline in 1994 it remains very high for several years. Hence the diverging evolution of the two economies after 1993. The story is plausible, but a question remains about the speed and the size of the impact of Cuba’s liberalization measures on output. A somewhat more systematic approach seeks to explain jointly Cuba’s economic performance and that of the countries in transition from plan to market, in a way that allows for the impact of stabilization and liberalization. This analysis was based on a cross-section time-series regression where the rate of growth in real GDP (g) was related to the ratio of investment to GDP (I/Q); the share of the private sector in the economy (s) used as a proxy for degree of liberalization; 11 the rate of inflation (π) and the square of that rate (to capture the adverse, nonlinear effects of inflation); and a variable to capture the negative effects on growth of armed conflicts in various countries during the sample period (war). The regression was estimated for 17 countries, including Cuba, using in most cases observations for the period 1990-97. Annex 2 defines variables and provides data sources. Adjusted R2 = 0.452 Number of observations = 157 t values adjusted for heteroskedasticity are shown in parenthesis. All the coefficients have the anticipated sign and, except for the investment ratio, are significantly different from zero at the 95 percent confidence level. The same equation was then estimated using a set of dummy variables for Cuba—one for each year from 1989 to 1997. The coefficients of these variables were negative through 1993, and positive thereafter. This indicates that Cuba’s real GDP growth was higher in the first period, and lower in the second, than would have been expected on the basis of the experience of transition countries. 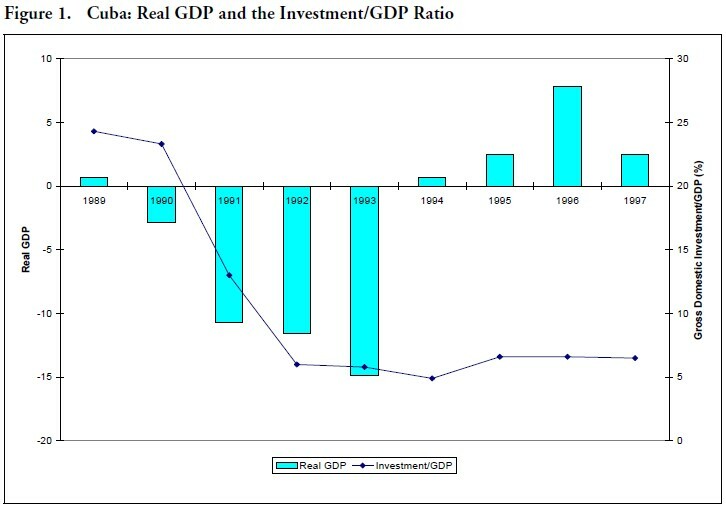 However, the coefficients of all these dummies were insignificantly different from zero, suggesting Cuba’s growth performance during the period, and particularly in 1994, was not significantly different from that of the other countries in the sample after controlling for the effects of investment, importance of the private sector, inflation, and conflicts. There is no definitive answer on whether the abrupt ending of the Cuban economy’s post Soviet collapse and the period of subsequent growth reflected improved policies or statistical fabrication. To be sure, there are gaps in the data, and there are some puzzling differences between data released by the government and by the Economic Commission for Latin America. There are also some internal puzzles, such as the large share of the state deficits that cannot be explained by monetary financing. The Cuban government can put an end to the remaining doubts by publishing a comprehensive and up-to-date data base. This being said, there is a degree of consistency within the available Cuban data set that argues against the possibility of a wholesale cooking of the data—a complicated enterprise in any event. 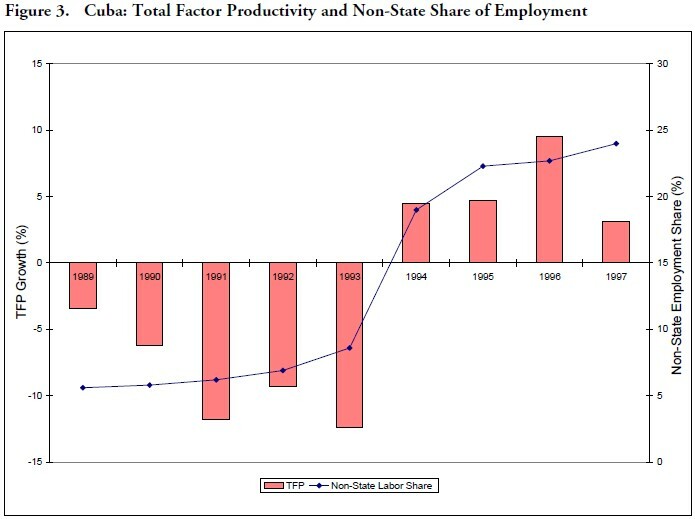 Moreover, the data appears to support the hypothesis that the growth of output and productivity in 1994-96 can be explained, at least in part, by the policies of macroeconomic stabilization and structural liberalization introduced in late 1993 and 1994, following the disastrous results of the policy of “adjustment by brute force” pursued initially in reaction to the end of Soviet assistance. It seems reasonable to conclude that the 1993-94 shift in policy was instrumental in turning the economy around, even though the liberalization measures were subject to frequent flip-flops and were limited in scope and intensity, in comparison with those implemented in the successful transition countries. In this regard, it is revealing that Cuba’s share of non-state employment leveled off at about one fourth in 1998, compared with 72 percent in China, 75 percent in Hungary, and 91 percent in Vietnam. This suggests two tentative conclusions. First, the backtracking on several liberalization measures may well explain the lackluster performance of the Cuban economy in 1997-98 and suggests that, on present policies, it is unlikely that living standards can be raised appreciably. Second, the considerable, favorable effects the partial liberalization measures implemented in 1993-94 indicate that a complete reform program would have a far-reaching beneficial impact on the Cuban economy. But this would mean getting the government out of people’s way and allowing the Cuban people (and not only the foreigners) to work, invest and realize profits. Data for I and N are from CEPAL (2000). The depreciation rate (δ) was assumed to be 9 percent per annum and the initial value of the real capital stock was taken form Madrid (1998). The following variables were used in the regressions discussed in the text. g = rate of growth of real GDP, from EBRD (1999). I /Q = ratio of gross domestic investment to GDP. For Cuba, China and Vietnam, ratio of gross fixed capital formation to GDP. s = share of private sector in GDP. For Cuba, China, and Vietnam, non-state sector share of employment. π = rate of consumer price inflation, annual average, from EBRD (1999). For Cuba, rate of increase in GDP deflator for goods. War = dummy variable for years in which armed conflicts were ongoing: Armenia (1990-93), Azerbaijan (1990-94), Croatia and Macedonia (1991- 92), Georgia (1990-93), Tajikistan (1993-95). Data for countries of the former Soviet Union, the Baltic countries and Eastern Europe are from EBRD (1999). Data for China and Vietnam are from IMF, World Economic Outlook. Data for Cuba are from CEPAL (2000) and Banco Central (2000). 1. The views expressed in this paper are the author’s and not necessarily those of the IMF. 2. These numbers are those provided by Pérez Villanueva (1998) and the Cuban Central Bank (1999 and 2000), and differ somewhat from those published in CEPAL (2000). 3. The full story of how the fiscal deficit was financed is still a bit of a mystery, however. As can be seen in Table 2, seignorage accounted for much, but by no means all, of the financing in the period 1989-97. Seignorage is measured as the ratio of the change in the money supply to GDP; the money supply includes currency and peso-denominated saving deposits. There is no official explanation as to how the rest of the deficit was financed, but external borrowing, use of official reserves and state payments arrears may have been part of the story. 4. The term “liberalization measures” is deliberately used instead of “structural reforms” to emphasize the tactical and potentially reversible nature of the measures. 5. Transfers from abroad are calculated in part as the turnover in dollar shops minus dollar earnings accounted for by official i ncentive schemes (Morris, 2000). As such, these transfers are though to represent predominantly, but not exclusively, remittances from Cuban residing in the United Sates, in the form of U.S. dollar bills. Transfers may also include remittances from Cuban residents working abroad (e.g., doctors and teachers), including in African countries. Net transfers from abroad minus net interest payments abroad accounts for the difference between national and domestic saving. 6. 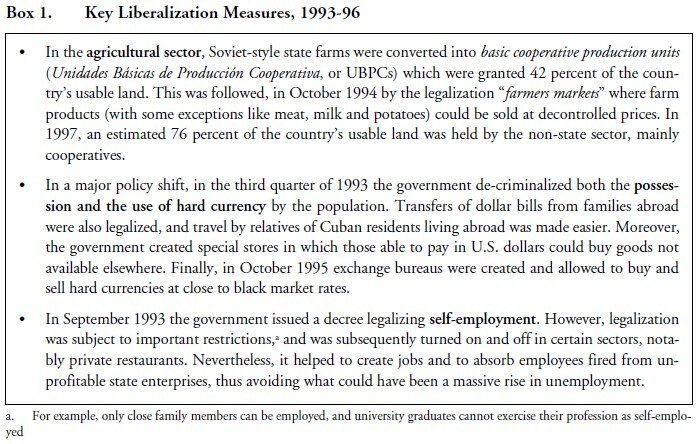 For a fuller discussion of these liberalization measures, see Pérez-López (1995 and 1998). 7. The calculations underlying the exercise are discussed in Annex 1. 8. Of course, other factors influence the growth differential between official GDP and power consumption, including changes in the relative price of energy, and the resulting changes in energy efficiency. These changes typically occur gradually and probably have relatively little influence on year-to-year movements in energy consumption. Energy shortages following the end of Soviet subsidies could explain why power consumption fell more rapidly than GDP in 1992-93. 9. The two indexes are (i) the ratio of the Alonso-Lago (1995) index of prices in free and black market prices to the GDP deflator (line 8); and (ii) the ratio of the U.S. consumer price index converted into pesos at the parallel market exchange rate to the Cuban GDP deflator (line 9). 10. The reasons for this pattern are associated with learning by doing by entrepreneurs, and the need to re-train the labor force (Brixiova, 1999) and to restructure the inefficient capital stock inherited from the old central panning system (Hernández-Catá, 1998). 11. More general liberalization indexes, such as those developed by de Melo, Denizer and Gelb (1997) for a large number of transition countries, are not available for Cuba. The private (or non-state) share has the advantage of avoiding judgmental elements in the construction of the liberalization variables, thus avoiding possible biases.